BELIZE CITY, Tues., Jan. 19, 2016–On December 9, 2015, a groundbreaking ceremony was held to build a Forward Operating Base (FOB) for the Belize Coast Guard two and half months after the Prime Minister announced that his government would build such a base at the mouth of the north bank of the Sarstoon River, in the middle of the Sarstoon River near Punta Gorda, Belize’s southernmost border with Guatemala, which, in 2015, became a lightning rod in Belize’s territorial dispute with Guatemala. The area also is a hotbed of a lot of illicit activities, mostly by Guatemalans illegally in the country. Two such incidents of confrontation and aggression against Belizeans by the navy of Guatemala took place in May of last year, when Coast Guard officers were harassed by the Guatemalan navy, and in August of that same year when Belize Territorial Volunteers and Northern Territorial Volunteers went on an expedition to Sarstoon Island and similarly were confronted by Guatemalan forces. Some of their members were physically prevented from landing on the Sarstoon Island by Guatemalan gunboats. 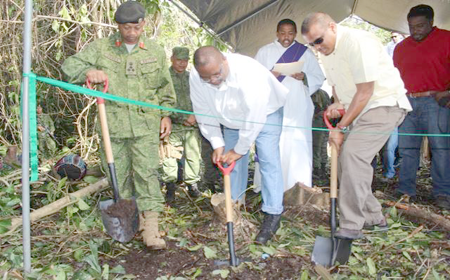 However, a little over a month after the groundbreaking ceremony for the construction of a base that could possibly avert such activities, the base is not anywhere close to completion, as Wil Maheia, political activist (PNP leader) of Punta Gorda and leader of the Belize Territorial Volunteers (BTV), told Amandala. He said that the BTV visited the area and they could not find any type of construction material there. Instead, they found Guatemalans in the area who were fishing illegally in Belizean waters. Maheia said that within minutes after his group arrived there, the Guatemalan navy showed up, not saying or doing anything, just making their presence known. He noted that they could not see any of the BDF soldiers, or Coast Guard officers patrolling the area where many Guatemalans frequent to do illegal fishing. According to belizeguatemala.blogspot.com, on April 30, 1859, a Boundary Treaty was signed by both Guatemala and Belize, in which Guatemala recognized Sarstoon Island as belonging to Belize. Amandala tried to contact Brigadier General David Jones but could not reach him for a comment on the situation.